Please be careful not to mistakenly combine full versions and abridged versions of Jonathan Swift's works. Fiona Campbell is a newcomer to tiny Ephraim, Wisconsin. Populated with artists and summer tourists, Ephraim has just enough going on to satisfy Fiona’s city tastes, but she is fascinated and repelled by what lies at the furthest tip of the Door County peninsula: Washington Island, a place utterly removed from the hubbub of modern life. North of the Tension Line is the first in a series following Fiona, a fierce female protagonist, and an accompanying cast of eccentric characters. At turns comic, romantic, and thought provoking, this book is part compelling romance and part-comedy-of-manners—evocative of the work of Alexander McCall Smith, Jan Karon, Miss Read, and Jane Austen. Adults and young adults alike will enjoy Fiona’s foray into the vicious politics of small town life, her encounters with a ruthless neighbor and the captain of a haunted ferry, and her eventual discovery of the peculiar spiritual renewal of life as it is north of the tension line. J. F. Riordan was born in New Jersey and moved first to Michigan, then Wisconsin as a child. At sixteen, after two years of high school, she went to the University of New Mexico to study voice and ultimately became a professional singer. After years of travel, she returned to the Midwest, finished her college degree, and became certified to teach high school English. She taught for three years in the inner city before taking a position as a program officer for a foundation. Jonathan Swift is currently considered a "single author." If one or more works are by a distinct, homonymous authors, go ahead and split the author. 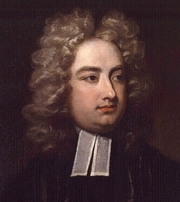 Jonathan Swift is composed of 21 names. You can examine and separate out names.